The flute is an integral instrument in many varieties of bands and orchestras, and it’s an instrument that is loved amongst beginners, intermediates and experts. Whilst the alto flute is not as popular as its siblings, it is still a popular choice - especially amongst flautists looking to increase their skills and repertoire. If you’re looking to purchase an alto flute, here at Dawkes we stock a variety of alto flutes at different budgets. 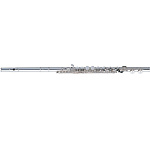 The alto flute is a variety of concert flute, and like other flutes, sits within the woodwind family. The alto flute also uses the same fingerings as the flute in C (so it is known as a transposing instrument). This means it's a simple transition to progress from one to the other. What makes the alto flute unique? The alto flute, unlike the flute in C, is known for its mellow tone and lower notes, and it actually plays a fourth lower than the regular flute (which is half an octave). It gives a beautiful deep sound and adds depth and tone to the flute section. Another difference between the alto flute and the regular flute, is that the tube on an alto flute is thicker than that of the flute in C, and is longer too. This means the player needs more breath control, which can take practice and time to master. Some alto flutes also have curved mouthpieces too - although not all of them. This does however make them visually different from the flute in C too. If you're looking to purchase an alto flute, our music experts are always on hand to offer you their advice and guidance in the matter. Feel free to get in touch with us to ask us any questions. What other flutes are available on Dawkes? The Piccolo - A half-size, smaller version of the classic Flute in C (or concert flute). The Flute in C - The classic flute, most widely played. 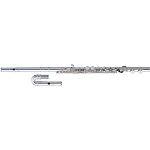 Alto Flute - As discussed above. The Bass Flute - As the name suggests, the bass flute has the lowest pitch of all the flutes. We understand that players have different requirements for their instruments, and we know that buying an instrument is an investment both financially and emotionally. We're on hand to assist you, should you need any help.